You Won’t Believe What Laser Dentistry In New York City Can Do For You! Did you know that an estimated 47% of Americans under the age of 65 have some form of gum disease? And, unfortunately, that percentage goes up to 70% in people over 65. Gum disease is serious because it’s the leading cause of tooth loss and also increases the risk of several health conditions like heart disease, Alzheimer’s, and stroke. That’s why it’s so important to get the best treatment possible, but while traditional treatments are effective, they also have several drawbacks. Fortunately, more modern procedures such as laser dentistry in New York City have been a complete game-changer by not only making treatment more effective, but also more comfortable. Learn more below about how laser dentistry has revolutionized gum therapy and how it can help you! What Does Traditional Gum Therapy Involve? To understand the advantages of a laser, it’s helpful to understand the basics of traditional treatments first. Generally, the first recommendation for gum disease is to perform “scaling and root planing” – also referred to as a deep cleaning. After your gums are numbed, plaque, tartar and bacteria (which are the main cause of gum disease) are removed from under your gumline. Since deep “pockets” have formed around your teeth, these are areas that can’t be reached with a toothbrush and floss, or even during a normal cleaning. The idea is that once the pockets have been thoroughly cleaned, the gums will reattach and pocket will be reduced to a normal depth of 1-3mm. For more advanced cases, gum surgery is recommended, which has traditionally been done using a scalpel to “flap” the gum tissue and expose the underlying bone and roots so they can be thoroughly cleaned and shaped. In addition, some of the gum tissue may be removed as a way of reducing the pocket. Then stitches are used to close up the area until it heals. Unfortunately, there can be drawbacks to these procedures. First, it’s nearly impossible to remove 100% of the bacteria that are responsible for gum disease with dental instruments alone. Second, this type of surgery requires significant healing time and can be painful for many patients. How Can Lasers Improve Gum Therapy? 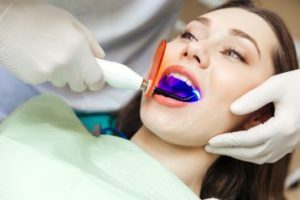 There are two main types of laser dentistry in New York City: Laser Assisted New Attachment Protocol (LANAP), used for natural teeth, and Laser Assisted Perio-Implantitis Protocol (LAPIP), which is used around implants. But even with all these advantages, the best part is that a LANAP laser is also more effective. In fact, lasers have been shown in peer-reviewed studies to kill 99.99% of the bacteria that cause gum disease under the gumline. Not to mention that the LANAP protocol also stimulates new tissue regeneration and helps your body build new bone mass around your teeth. You simply can’t get these benefits with traditional treatment! After completing dental school in 1992 and working for the U.S. Public Health Service for several years, Dr. Steven Bizzell realized he had a particular interest in gum health and pursued advanced training in periodontology. He’s thrilled to offer his patients laser therapy because he’s seen firsthand how much more comfortable and effective it is. If you have any questions about how lasers can help you, he can be reached via his website or at (718) 530-6539.